Its been raining plums thanks to the KitchenAid Contest, IFBM 2014 and the season of course! The team is keeping all participants on their toes dishing out recipes for various contests with attractive prizes. And before I knew it, I was home with more plums. How can I be immune to the lure and charms of that sleek, gorgeous chopper! The plums soon found their way into some quick and easy, Chantilly Crepes filled with vanilla stewed plums, fresh ricotta and honey. 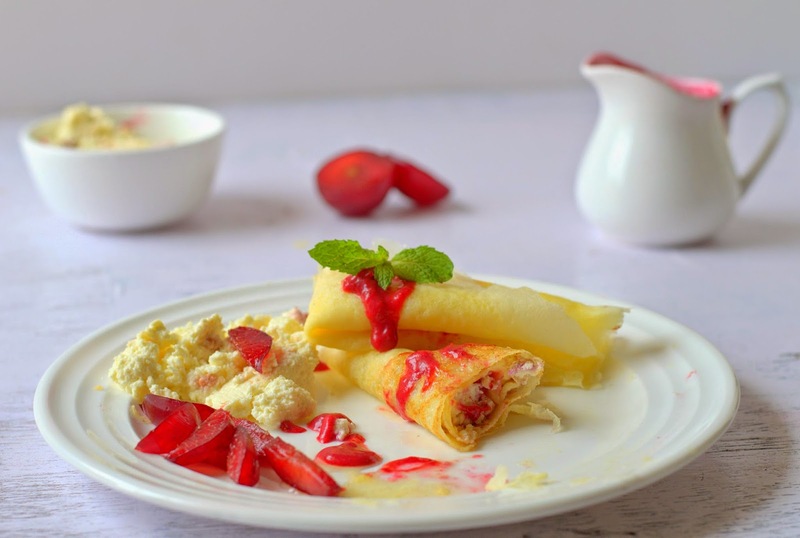 Being born and brought up in the south of India, the concept of crepes is not entirely new . But the kind I came across later were nothing like we the ones we grew up eating. Versatile and delicious, these were a revelation! The batter being mostly just eggs, flour, milk, butter and sugar whizzed in the blender, you can rustle up crepes in a jiffy. Conveniently, the batter can be made ahead and refrigerated. 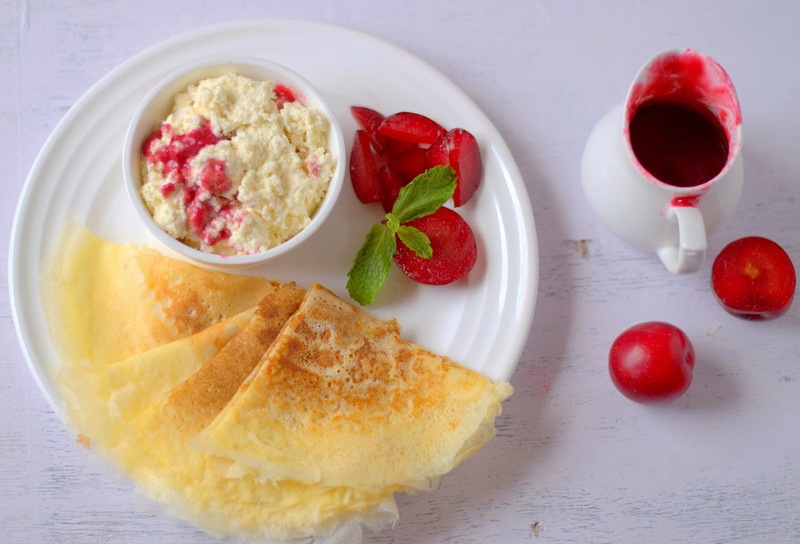 The crepes can be refrigerated or even frozen. Barely sweet, these lend themselves beautifully to sweet and savory fillings. Drizzle them with honey or simply sprinkle some sugar on them for a light snack. Fill them with fresh or poached fruit , or cheese and vegetables as you wish for a substantial brunch. Filled with lightly whipped cream or mascarpone, dessert is served! Chantilly crepes from The Cake Bible are what I would call as dessert crepes. Made with cornstarch, these are tender, light and delicate, the perfect vehicle for indulgent dessert fillings. The quantity of the components of this dessert varies with the amount of filling you would like in them. Use honey and plum puree to taste. It doesn't hurt to have more of each on hand, you can always use leftovers to make more dessert! Heat the butter in a saucepan. Add the rest of the ingredients. Stirring occasionally, cook on low heat till the plums are soft and mushy, about 5 minutes. Fish out the bean, just mash with a fork or puree the pulp. Strain if needed. Refrigerate. You can make this a day or two ahead. The recipe recommends using a 6'' crepe pan. I have used a larger non-stick frying pan. Procedure : Place the ingredients in the given order in the medium or large sized jar of your blender. Blend at high speed for 10 seconds. Heat the crepe pan on medium high heat until hot enough to sizzle a drop of water. Brush lightly with the clarified butter and pour a scant 2 tablespoons of batter into the center. Ladle scant 2 tablespoons of batter in the center of the pan. Immediately tilt the pan to the left and then down and around to the right so that the batter moves in a counter-clockwise direction, covering the entire pan. Cook until the top starts to dull and the edges begin to brown. about 15- 20 seconds. Rose recommends using a sharp metal spatula to lift the edge to see the color. Flip carefully as the crepes are quite delicate. Cook for another 10 seconds or until lightly browned. Invert the pan over a plate. Turning out perfect lacy crepes am sure is an art in itself and I hope to get there some day. If these are good, I can imagine the perfect ones can only be even better! 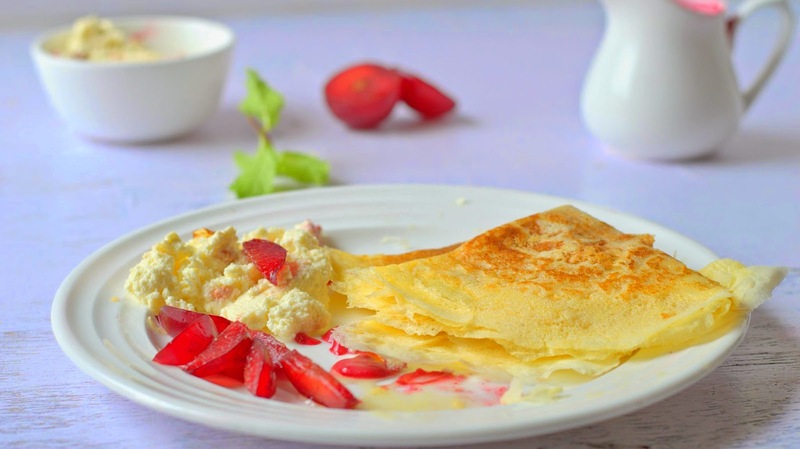 Storing : Refrigerate the crepes for upto 2 days, freeze upto 3 months. If using the crepes on the same day, its fine to stack them. If refrigerating or freezing them, use parchment pieces to separate them. Please note : If making crepes for the first time, try using a pan of the recommended size. I must get myself a smaller pan! Take 2 tablespoons plus a little more of batter in a small cup so that you can pour the batter all at once. Hold back the extra batter and use only if needed to fill any gaps. The amount of batter and the size of the pan will make your crepes thinner or thicker. Easy and right heat control should help make softer crepes. Cooking them longer will make them dry and kind of crisp, especially if the batter is less spread thin. Cornstarch : You can use upto 120 grams / 1 cup cornstarch if you want the crepes thicker. If using, 1 cup cornflour you will get more crepes. Crepe batter made with all purpose flour normally is refrigerated for a while after mixing. This batter can be used immediately. Place the crepes on a large plate, attractive side down. Spoon some ricotta, then honey and some plum puree. Roll it up. Serve with more honey and plum puree on the side.